This week’s Gold Coast and Tweed estuary fishing tips and report sponsored by Big Hit Fishing. We caught nothing. 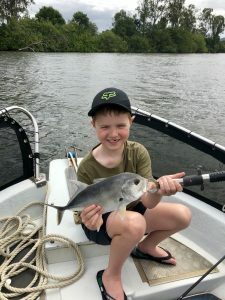 There’s no fish left in the Broadwater. If I had a dollar for every time I heard that from other boats when getting back to the boat ramp, I would be able to buy quite a few cartons of beer! 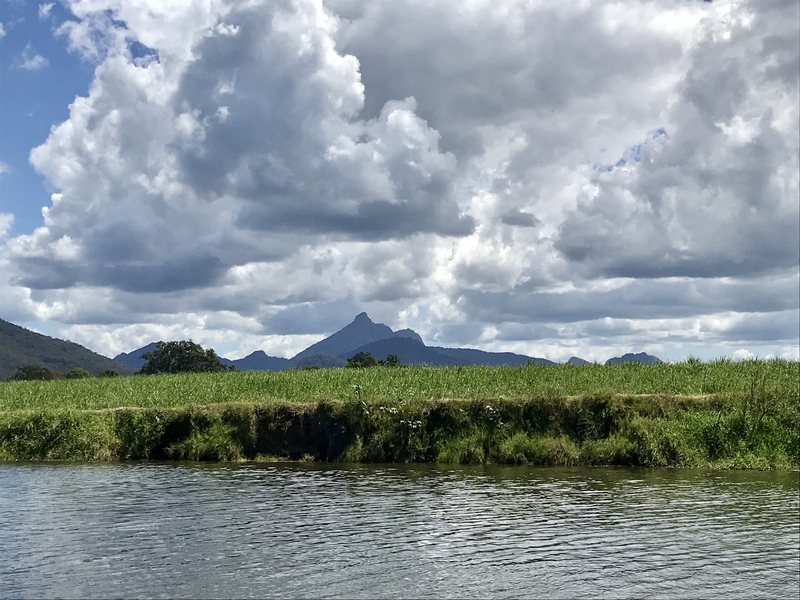 So let’s get back to basics and help them catch fish. 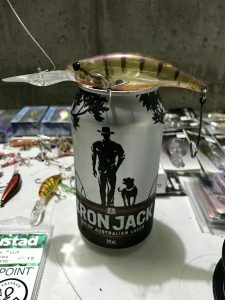 One thing that really stands out when I look in their boats is big clunky rods with heavy sinkers, big hooks, and a big chunk of frozen squid from the servo hanging off the hooks. Great way to catch nothing. Use some nice light rods, smaller sinkers just big enough to reach the bottom, no.4 size baitholder hooks, 6 lb line and 10 lb leader, with fresh bait. 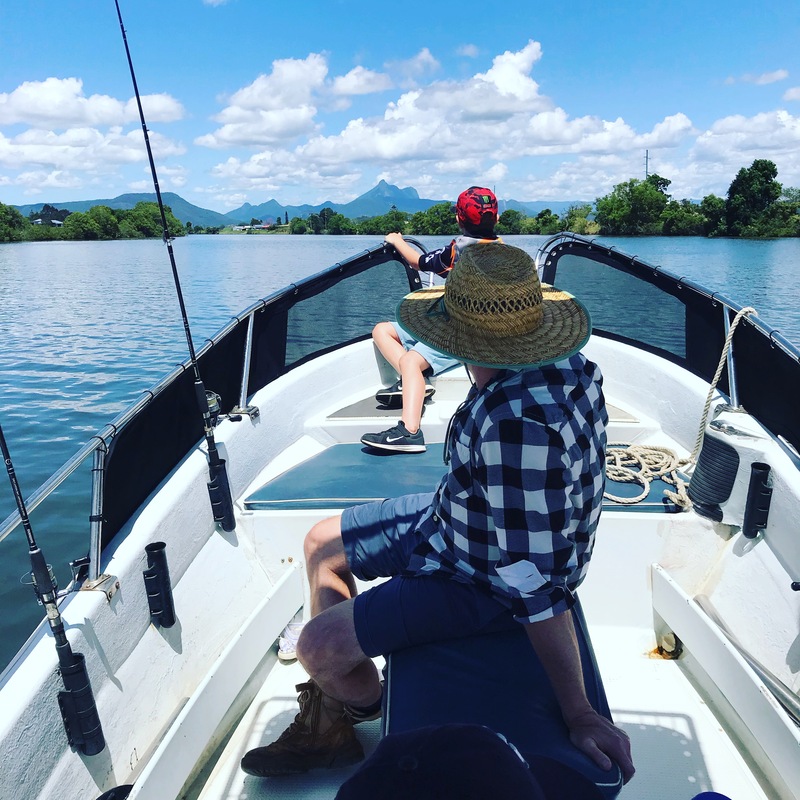 You can’t go wrong with fresh yabbies or fish caught in a cast net. Then go out there and find an area to drift at an even speed, and keep moving until you get bites. Don’t anchor unless you find a good nest of feeding fish. 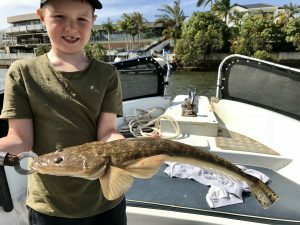 Same goes for the lures, small lures and light tackle still catch big fish but also get more bites in heavily fished areas like the Gold Coast. 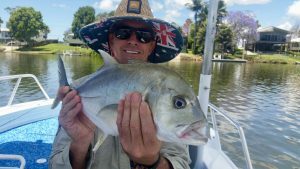 For more tips book a charter with us and we’ll teach you heaps more and be the envy of others back at the ramp. 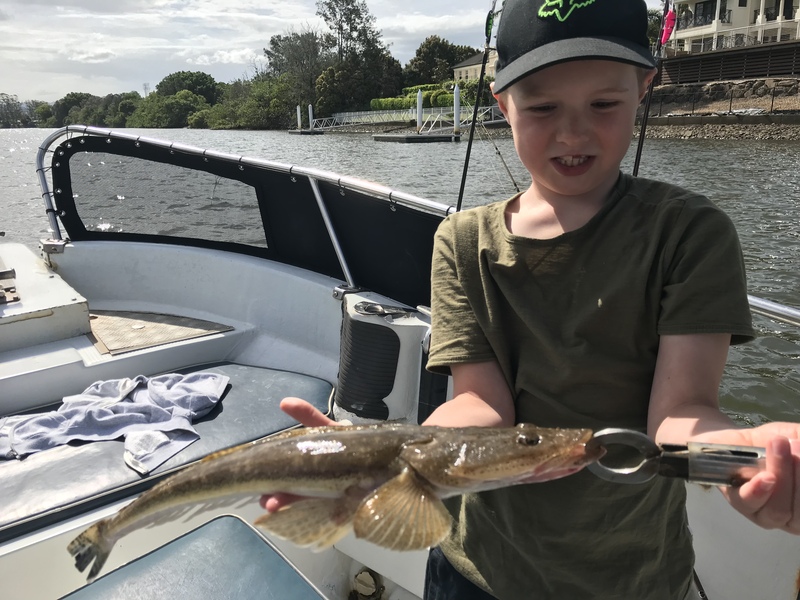 Brad has been working the upper reaches of the river, putting his clients onto some big whiting, as well as finding mulloway, trevally, and flathead in the deeper holes on vibe style lures, and this nice Mulloway pictured below caught trolling a Savage Gear hard body. The water has fully cleared up again, and the bait fish has moved well upstream. Clint has been finding some big fish in Nerang river including the thumper Estuary cod pictured, which smashed an Atomic 85mm double deep lure. His son Archer caught some nice flathead to 58cm and a sporty little GT too! There has been a lack of bait in the lower river too, so hunting well upstream is the go for flathead and GT’s, although the numbers are down. Transparent and pale/ natural colour lures work best. 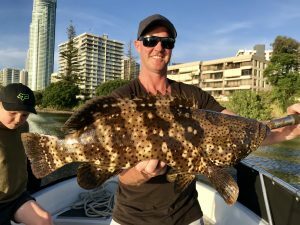 The broadwater has been more consistent for quantity with flathead, whiting, flounder, trevally, and tarwine all going for Ecogear blades and soft vibes. 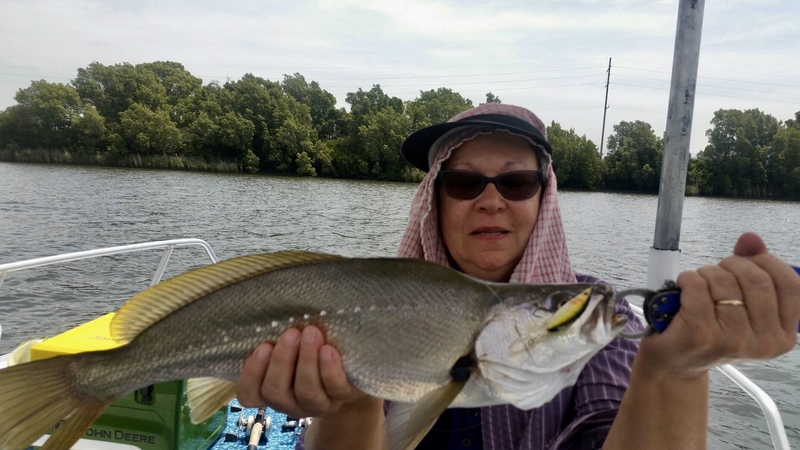 This weekend features neap tides, which provides a bigger window of opportunity to fish near the mouths of rivers for mangrove jacks, mulloway, and others. The last few hours of the run out tide and first few hours of the run in will be best.